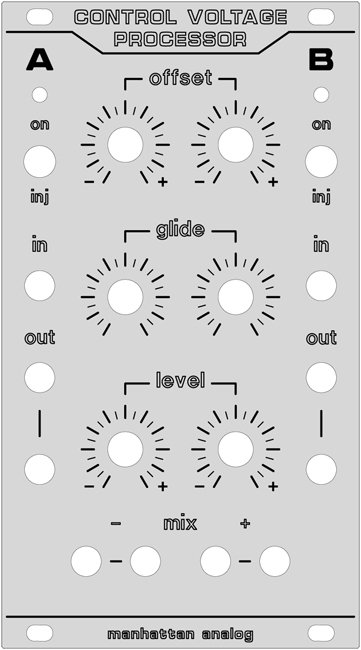 The simple but useful circuit was originally designed by Chris MacDonald, modified by Peter Grenader, then further modified by Matthias Herrmann (fonik) and released as a schematic and P&P layout in 2006. It has +/-5v of offset, a glide control, and an attenuverter. There are pads on the board for one bi-color LED. I based this heavily on Matthias' version of the circuit, with an additional buffered THROUGH connection and a modified output stage which will now drive a passive multiple. This is being produced with Matthias' blessing. - MOTM + Euro power connections. - On-board pots: 1" on-center to match the 4hp Euro panels. - 2 mounting holes for those who don't want 1" pot spacing and wish to use a bracket. The PANEL price is $15.00/ea. 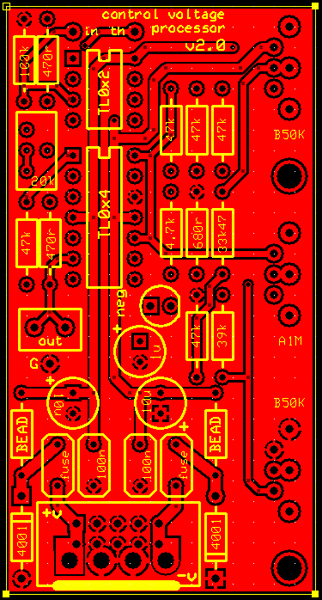 The PCB price is $10.00/ea, and there will be a $3 shipping charge per order. I will gladly ship overseas for an extra $8 per order. The best way to pay is with Paypal - my address is jcoates42 (at) gmail [dot] com. Count me in for four! I would like 8 please. i know i want 2. i will potentially want 4. as a relatively new wiggler, i am a bit in the dark on what i could do with this. if anyone cares to shed some light, i will more then likely get 4.
i am a bit in the dark on what i could do with this. if anyone cares to shed some light, i will more then likely get 4.
yes please illuminate me as well. overall dimensions of the board, por favor? It's just a basic set of CV tools. The offset/attenuator controls are useful for scaling and shifting voltages - turning a +/- 2.5v waveform into a 0-5v signal to open a VCA or squashing a 0-5v signal into a 1-3v signal prior to a quantizer, for example. The glide circuit is a simple slew, good for taking the edge off of fast triggers to eliminate VCA click, adding glide to a pitch CV for portamento, etc. I use it with my RCD & uStep to turn the triggers into 'softer' events for more subtle modulations. Here's the panel that this has been designed for, it might give you some idea as to what it actually does in the real world. (I know seeing a panel design always helps me grok a module.) This panel uses 2 of these PCBs, one per channel. The mix section is done offboard with an additional CGS04 PCB and the two switches up top are ON-OFF-(ON) switches for muting or manually injecting the signal, what have you. This board looks like it would be a single CV processor yeah? I ask cause Fonix's module contains 2 right next to each other an the 255 has 8 in one module. If it's just a single, I think I'll late 4. Yes, it is a single board per channel. 4 please. Thank you for this. Very cool. Can you put me down for 4 x these, please. Thankls!